The US war against Syria was one that people almost stopped. President Obama was unable to get Congress to authorize the war in 2013, but the Pentagon and foreign policy establishment, who have long wanted to control Syria, pushed forward with war anyway. It has been a disaster. The war has resulted in hundreds of thousands of deaths and injuries as well six million people displaced within the country and five million people who have fled the country. The people were right, and the military was wrong. The war on Syria never should have happened and now must end. President Trump announced withdrawal from Syria this week. This creates an opportunity to end the war on Syria. We have work to do to make peace a reality. 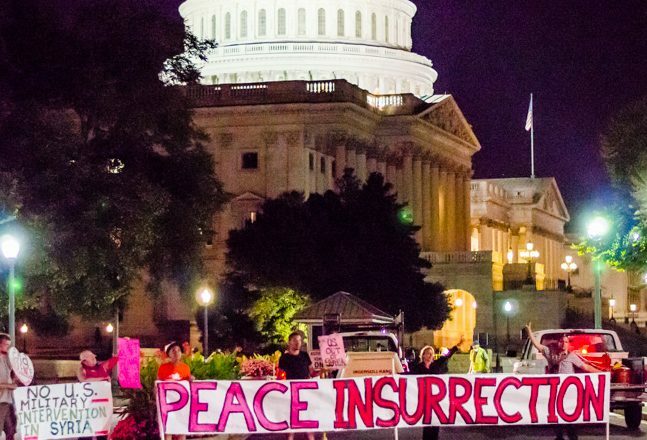 Peace Insurrection on Capitol Hill 2013, CODE PINK. Photo by Cool Revolution. In 2013, amidst highly-doubted, unproven allegations of a chemical attack by Syrian President Assad (debunked a year later), the threat of war escalated, and so did opposition to the war. Protests against an attack on Syria took place around the world. In the US, people were in the streets and speaking out at town halls. Obama was forced to bring the issue to Congress for authorization. Congress was barraged with a Peace Insurrection encamped outside its doors, sit-ins in Congressional offices, and a massive number of phone calls with 499 to 1 opposing the war. Obama could not get the votes to support the war. Harry Reid surrendered to the public by never holding a vote. The other superpower, the people, had stopped a war. Obama became the first president to announce a bombing campaign who was forced to back down by the people. But the victory would be temporary, neocons and militarists continued to push for war. Based on new fake terror fears, and false chemical attack allegations, the ‘humanitarian’ destruction of Syria proceeded. WSWS described how the war escalated under Obama, writing, “The illegal US occupation of Syria, begun under the Obama administration in October 2015 without authorization from either the United Nations or the Syrian government.” There was a shift from CIA support for Al Qaeda-linked militias to war to bring down the Assad government. US troops coordinated a campaign of airstrikes that reduced the city of Raqqa and other Syrian communities to rubble. Amnesty International, after conducting field investigations, reported the US has committed war crimes in Syria. Vijay Prashad described the US creating “hell on Earth” in Syria. Despite this, the US was losing the war in Syria. With Russia coming to the aid of its ally, Assad was not going to be removed. Trump escalated and drove the US deeper into the Middle East quagmire betraying the non-interventionist base who elected him. The corporate media praised Trump as ‘becoming president’ for bombing Syria based on another unproven chemical attack. Later, even General Mattis admitted there was no evidence tying Assad to chemical attacks. Early this year, the Trump administration was announced a permanent presence in one-third of Syria with 30,000 Syrian Kurds as the ground forces, US air support, and eight new US bases. Protests continued against the bombing of Syria throughout the spring in the US and around the world. Now, as Andre Vltchek describes, the Syrian people have prevailed and most of the country is liberated. People are returning and rebuilding. 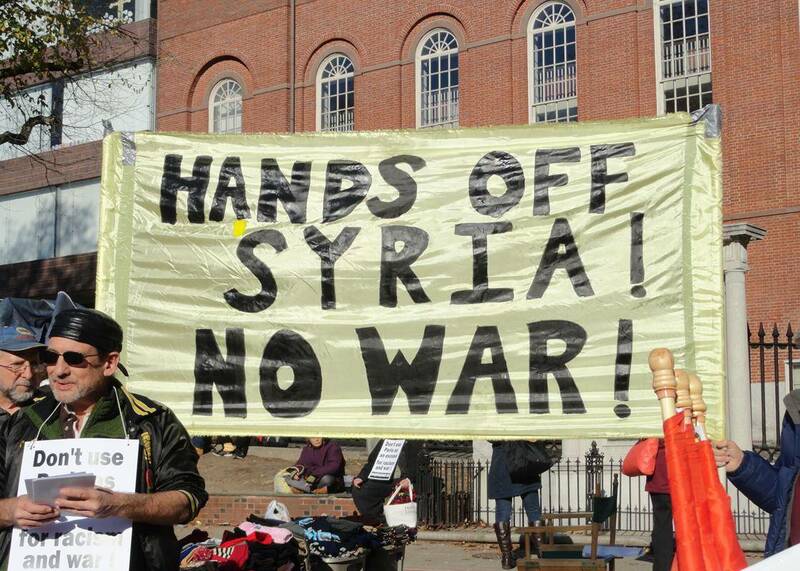 Boston Anti-War Protest: ‘Hands Off Syria! No War! Nov. 21 2016 by ShaunaDorothy in Socialist. There has been very little support for withdrawal from elected officials. Many Republicans and the corporate media are criticizing Trump. The first two Democrats to step forward to support the removal of troops were Rep. Ted Lieu, a frequent Trump critic who applauded the action, and Rep. Ro Khanna. But, the bi-partisan war Congress opposes Trump. Mattis is the fourth of “My Generals,” as Trump called them, to leave the administration, e.g. Director of Homeland Security and then Chief of Staff, John Kelly, National Security Adviser H.R. McMaster, and National Security Adviser Michael Flynn. This leaves neocon extremist John Bolton and pro-militarist Mike Pompeo as the biggest influences on Trump’s foreign policy. Popular Resistance supports the withdrawal of troops from Syria and applauds Trump’s decision. Veterans for Peace supports the withdrawal saying the US has “no legal right to be [there] in the first place” and describing the brutal destruction caused by US bombs. Black Alliance for Peace supports the withdrawal writing the war “should have never been allowed in the first place.” They denounce the corporate press and members of the political duopoly for opposing the withdrawal. BAP also recognizes that the foreign policy establishment will fight this withdrawal and promises to work to end all US involvement in Syria and other nations. 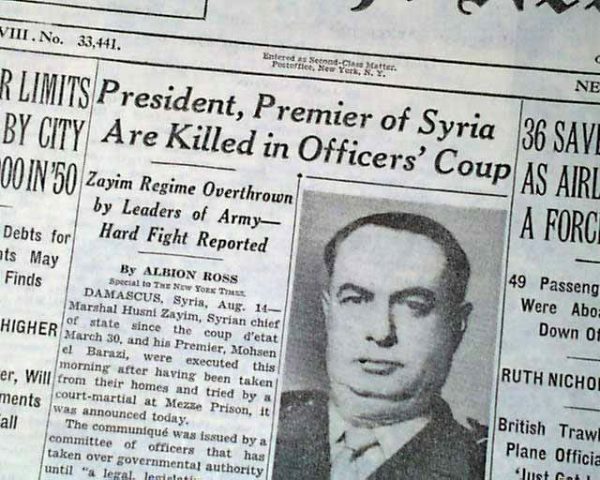 New York Times reports the coup which overthrew the country’s democratically elected government. 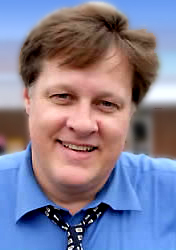 Stephen J. Meade, the U.S. assistant military attaché who was also a CIA officer, worked with the Syrian chief of staff, Husni Zaim, to plan a coup. The US was concerned about Syria’s stance on Israel, border disputes with Turkey, and oil pipelines, and worried that the left was growing in power and that the government was growing friendlier to the Soviet Union. Will the Long History Of US Regime Change In Syria End? Trump is being fought because the US has a long history of trying to control Syria dating back to the 1940s. Controlling Syria has been a consistent policy objective. CIA documents from 1986 describe how the US could remove the Assad family. While the bulk of destruction of Syria occurred during the Obama administration, plans for the current war and overthrowing Assad date back to the George W. Bush administration. A State Department cable, “Influencing the SARG In The End Of 2006”, examines strategies to bring about regime change in Syria. As Trump’s removal of US troops from Syria challenges the foreign policy establishment, which seemed to be planning a long-term presence in Syria, the movement must support Trump to end the war. 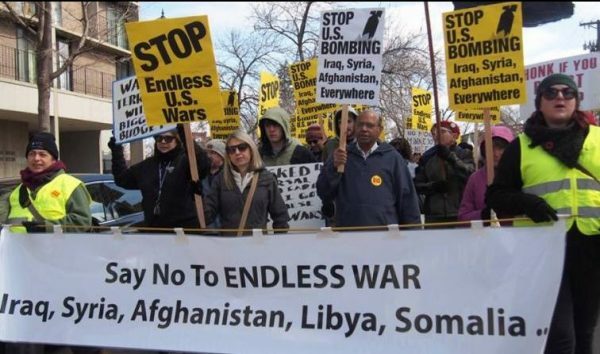 Stop Endless Wars from the Anti-War Committee. We saw this scenario play out earlier this month when Trump complained about the Pentagon’s out-of-control budget and pledged to cut it. As Lawrence points out, just days later the president met with Mattis and the chairmen of the House and Senate Armed Services Committee and announced that the three had agreed on a 2020 defense budget of $750 billion, a 5 percent increase. Trump has made no progress on North Korea since the first meeting and has been prevented from making progress on positive relations with Russia. The foreign policy establishment of the Pentagon, State Department, Intelligence Agencies, weapons makers and Congressional hawks are in control. Trump will need all the help he can get to overcome them and withdraw from Syria. We should urge Trump to be clear that ALL troops are leaving Syria. This should include not only the troops on the ground but the air force as well as private contractors. The CIA should also stop its secret war on Syria. And the US should leave the military bases it has built in Syria. Similarly, the movement should support Trump’s calls to withdraw from Afghanistan. The US has done incredible damage to Syria and owes restitution, which is needed to help bring Syria back to normalcy. Syria and Afghanistan join the list of failed and counterproductive US wars. These are more signs of a failing empire. The people of the United States must rise up to finish the job we started in 2013 — stop the war on Syria, a war that never should have occurred.